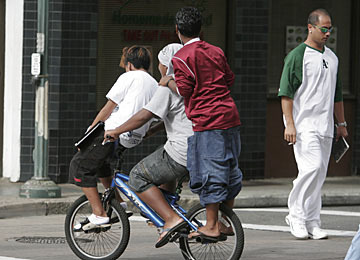 How many boys can fit on a bicycle? These three deftly made their way down Hotel Street on Tuesday. 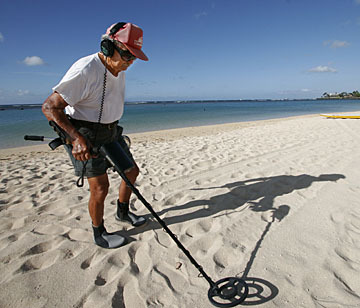 Francis Yee says he gets his exercise while scanning the sand with his metal detector. He was at Ala Moana Beach yesterday, but he says he goes to different beaches. He said he has been asked to find wedding rings lost in the sand for women who were just married, and has found two rings, returning them to tearful but thankful newlyweds. He also said he has found keys for people who said they cannot get into their cars or homes without their keys.